Little People friends love to play and explore the great big world around them, just like real kids! By creating kid-sized versions of real-life experiences, Fisher-Price has crafted a hands-on way for kids to learn about being a caring friend, a kind neighbor, an active community member, and all the other extraordinary qualities you see shining through in your little person. Build a whole collection of Little People playsets and your kids will discover more about the world in wonderful, imaginative ways! Ahoy there! Captain Beau of the Travel Together Friend Ship welcomes Mia and your little one aboard! 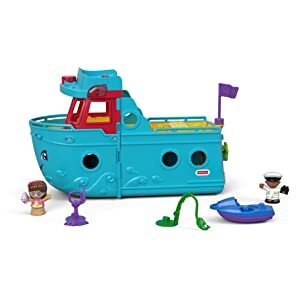 With this 2-in-1 playset, toddlers can set sail on all kinds of imaginative adventures with exciting songs, sounds, and phrases about being kind, traveling and playing together. Roll the ship along to ‘cruise’ from one adventure to the next, then open it up to reveal a beach adventure playset! Sailing on the Friend Ship shows kids that wherever they go, friends make it fun! Welcome aboard the Fisher-Price Little People Friend Ship! 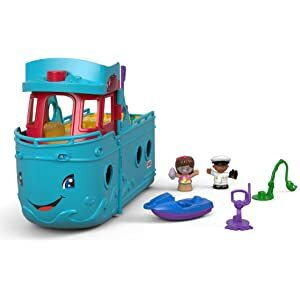 Your toddler will love setting sail on the deep blue sea with their Fisher-Price Little People friends aboard the Travel Together Friend Ship! 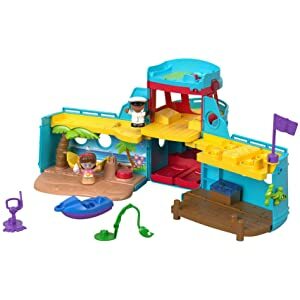 Kids can cruise from one adventure to the next, popping open the ship to reveal a multi-story play set featuring a beach setting with swinging hammock, a fold-out waterfront pier, a deck-top table set, and more. 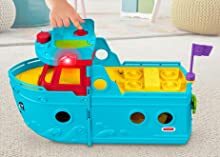 With exciting activity play pieces, realistic sounds, and fun songs about kindness and thinking of others, this Fisher-Price Little People cruise ship and playset is full of possibilities! Cast off on new adventures! All aboard, it’s time to embark on exciting adventures with Captain Beau and Mia ! Push down on the captain’s seat to activate the lights and music, and push the cruise ship along to ‘sail’ across the seas. 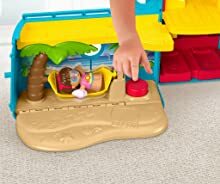 Then, open up the ship to reveal a multi-level beach destination within! ‘Life vest? Check. Sun screen? Check. I’m ready to swim!’ Mia can dive into all sorts of fun water activities, including jet skiing, snorkeling, or ‘reeling’ in a fresh catch with the fishing pole. When it’s time to relax, press the Discovery Button to swing Mia in the cozy hammock. After a delicious dinner on the deck-top dining area, Mia can curl up in the lower-deck bedroom and rest up for another action-Packed day aboard the Travel Together Friend Ship! 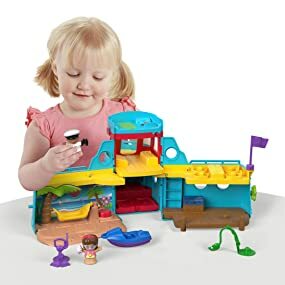 Fisher-Price Little People toys are made for exploring and sharing to bring out the kind, helpful, and compassionate qualities you already see shining through in your little person. As your kiddo acts out exciting travel adventures with Captain Beau and Mia , they begin to see how much fun it can be to share new experiences with others! Press the captain’s seat for exciting songs, sounds & phrases. Go for a ‘spin’ on the jet ski, snap on the snorkel for underwater exploration, grab a snack on the dock, or throw in a line & ‘reel’ in the catch of the day!